Here we see an exclusion barrier installed at a typical place. The roof of a back porch goes right under the soffit of the home. 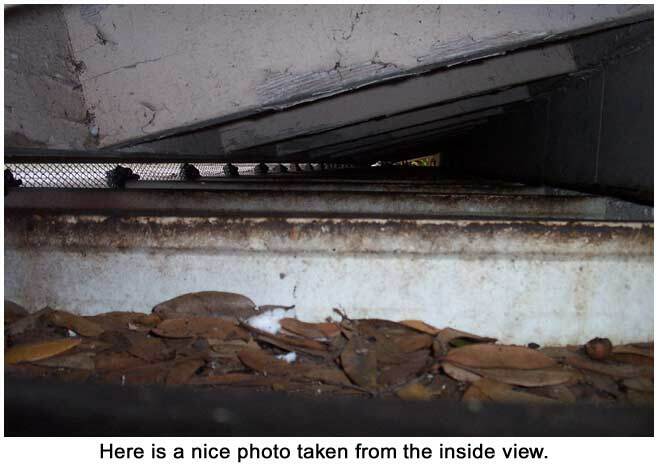 Squirrels, rats, and mice were able to walk right on this roof and crawl into holes in the soffit. It's impossible to repair those holes with the porch roof blocking the way, so a barrier must be built across the entire perimeter of the gap. What Are Some Attic Entry Points Squirrels Use: Attics are a great area for squirrels to get into. They love the space because it provides such protection and comfort for them. They are safe from rain and wind as well as cold and snow. Additionally, it brings them very close to any possible food sources. When food outside becomes scarce, they may decide to gnaw their way through the ceilings to enter the home and find what food is available. Attics also provide much safety from other predators for their young. They won’t have to worry about snakes making a meal of their babies or hawks and other predatory birds spotting them. With their ability to climb, squirrels can find attic entry points where you would have never even thought to check. However, if you know that squirrels have gained access to your attic, you also know that they have gotten in somehow and it is now up to you to spot their entry portal. You may inspect under the eaves to see on the outside where they may have found a hole. Or, you may inspect the attic from the inside to see an entry. If you can’t find the entry point or points, you may have to exercise extreme patience and try to observe them to see how they enter your attic. Get Squirrels Out Of The Attic: If you noticed that you may have a squirrel or two in your attic, you definitely have to do something about it. As cute as they are in nature, where they belong, they are a serious nuisance in an attic. They chew on electrical wires, which can prove to be hazardous to you. Odor is a great deterrent to keep squirrels from entering your attic. The best way to get them out is by spreading an unpleasant odor to the area they chose for their home. Make sure you wear rubber gloves and a face mask when you go up into the attic. Also be certain that the entry door into the attic seals tightly so that the squirrels cannot escape by that route. Most times these squirrels will run out during the day and you can cover in the last hole, keeping them from reentering. If this doesn’t work you’ll need to consider traps or even poison. Some people will suggesty you use ammonia soaked rags to leave the odor around an área detering them from coming back. This doesn’t yield the best results. Then find the place where the squirrels come into the attic and close it up with some tightly woven chicken wire.